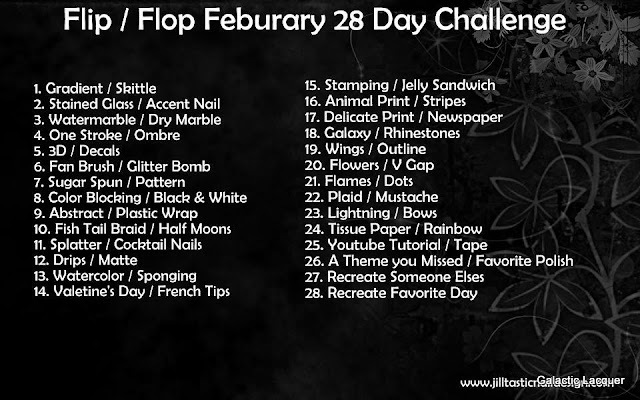 Well today is the last day of this Flip Flop February challenge. It's been really fun, but it's also been pretty exhausting posting everyday this month! I did a lot of fun nail art though, but it will also be nice to be able to get some swatching done after this. I had a lot of nails that I really liked from this challenge, but I think the ones I did for day 20 are my favorite. 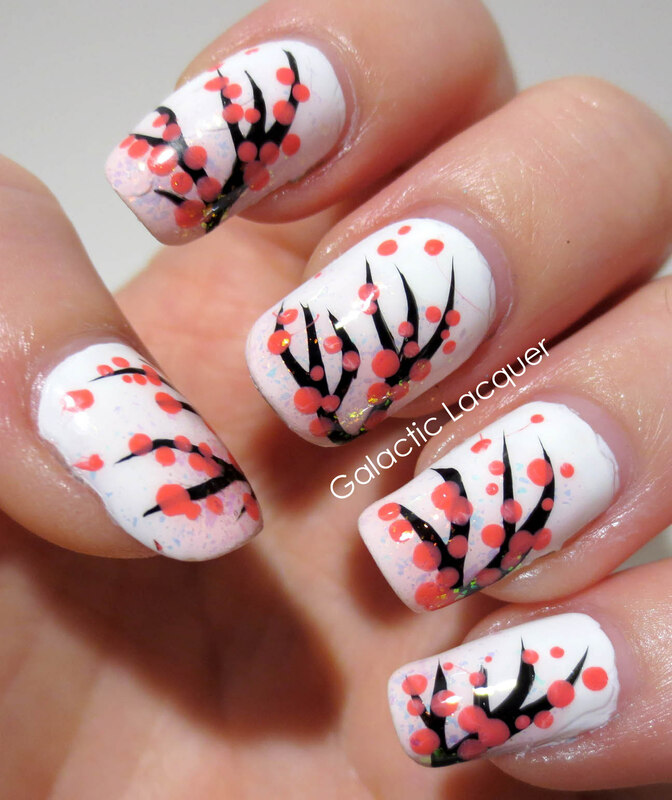 I did cherry blossoms since the theme was flowers. But that challenge wasn't too long ago - only about a week! So I didn't want to recreate it exactly the same way. So I switched up the colors. I guess it's more like a normal tree with green leaves now instead of flowery cherry blossoms, but oh well. It's the same design! It's funny how different it can look just by changing the color from pink to green. 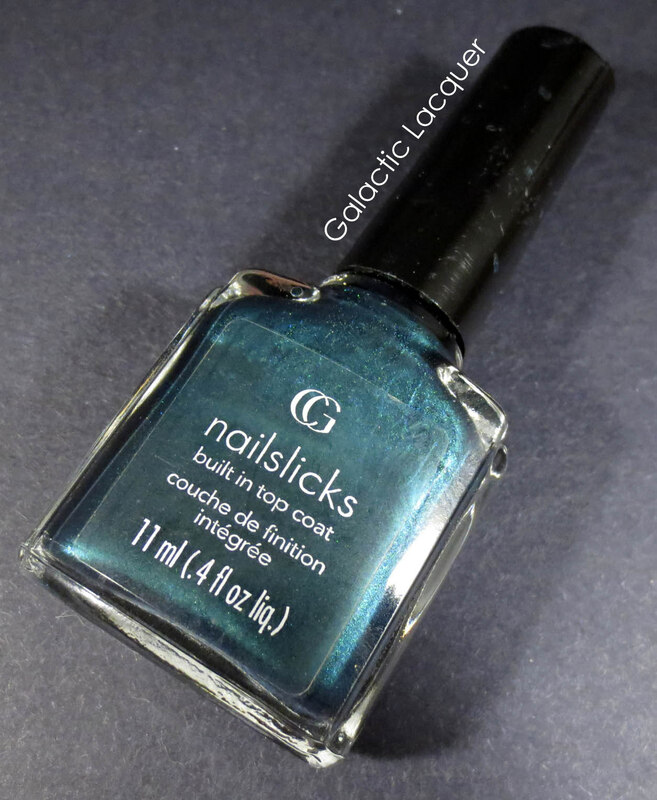 I was also considering trying blue, but I thought green would be a nice transition into March since Saint Patrick's Day will be coming up (and another nail art challenge too!). I used the same method as last time for these nails. I started with a coat of Ulta Snow White, and then lightly painted on Zoya Opal for a sheer green tint in the corner of each nail. I free handed the black branches on with a nail art brush, and then dotted the leaves with Essie Mojito Madness. I topped it all with Seche Vite and that was it! Wow, I can't believe the challenge is over already! February was a quick month for me. Now I look forward to Saint Patrick's nail art and Easter nail art for March! I was so torn over what to do today. There were so many amazing manicures done by everyone, soI wasn't sure which one to choose! I was feeling in a flowery mood, so I went with a flower design originally done by I Feel Polished! I didn't have exactly the same colors that she did, but I tried! The design almost reminds me of most vintage rose patterns with the striped background, except the flowers are much more modern and stylized. I started off with a base coat of Ulta's Snow White. I then place striping tape down each nail vertically, and painted Milani U Pinky Swear over it. While it was still wet, I removed the striping tape. I then took my largest dotting tool and started dotting the base of each flower. I finished the rest of the flowers by using China Glaze Re-fresh Mint and Zoya Lara. I put one of each flower on each nail - one with Re-fresh Mint as a base, and one with Lara as a base. I then added one last dot of Snow White for the center of each flower. It really helped tie the flowers into the background! I really like how they turned out! It's a design that I wouldn't have thought of myself, and I really like it. I think I Feel Polished did it better though! My white stripes got messed up when I removed the tape, even though I waited a very long time for it to dry, and my mint flower petals are a bit streaky. It's a really cute design though! It's very bright and is really getting me geared up for springtime. It's really difficult for me to choose an absolute favorite polish. 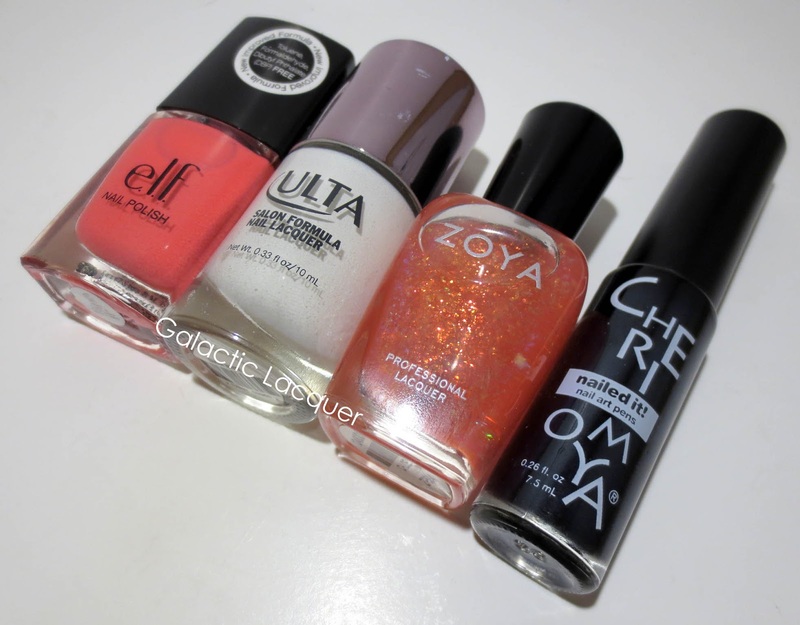 I've acquired many polishes in the past year having this blog, and I actually haven't found any that I really dislike! So I went for an older one that somewhat began my polish addiction. 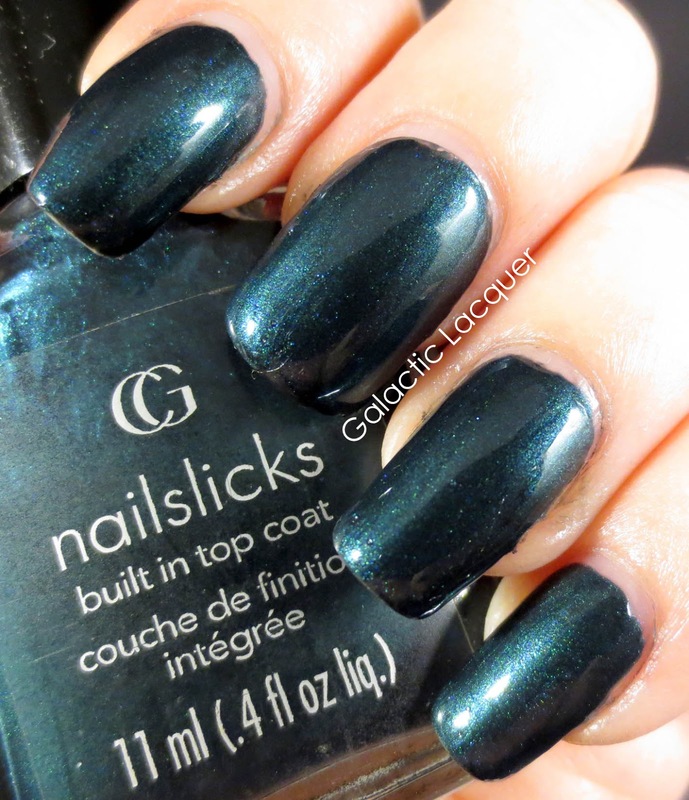 This polished is CG Nailslicks in Mystic Peacock. I remember buying this one years ago when a local grocery store was going out of business. Everything in the store was 75% off or more, and the beauty area had nothing on the shelf except for this polish. I was immediately drawn to it! There were actually two left of this color, so I grabbed both. One bottle is already gone, and it's probably the first polish I've actually used up entirely! This one has about half remaining. I used it a lot, obviously. I was a nail biter for pretty much my entire life, but this polish helped change that! I figured if I had pretty polish on, it would help me kick the habit. And it did. I would apply it just about weekly. 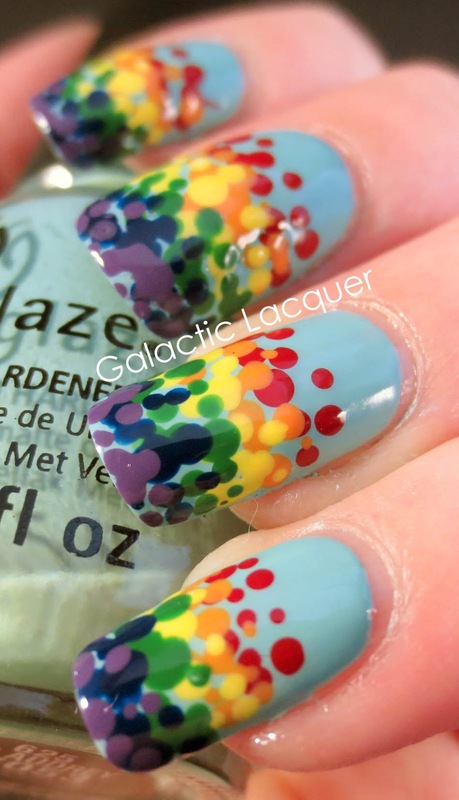 I would use one or two coats, depending on if some thin spots showed or not. It's very opaque and covers well in one coat. 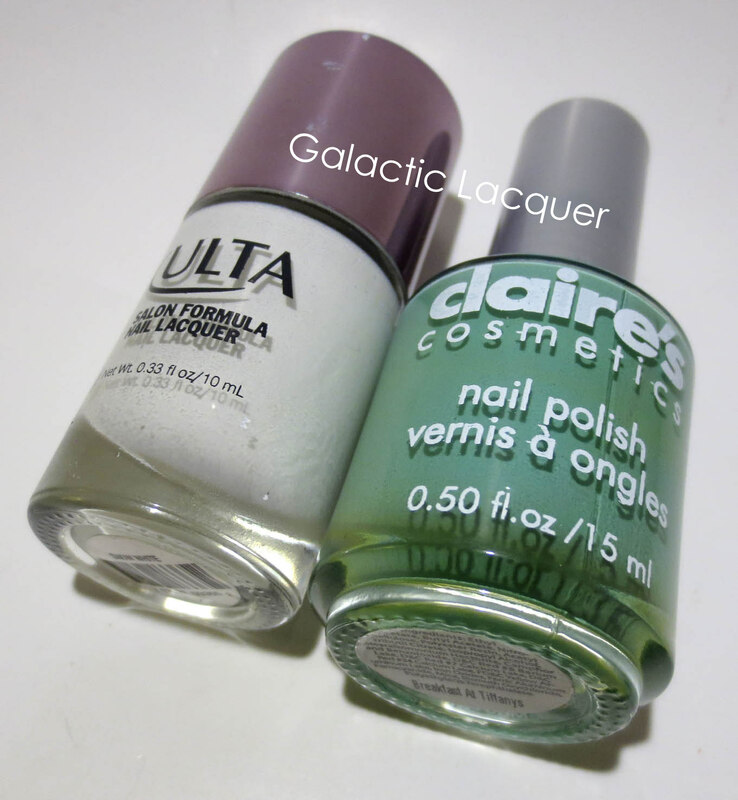 But I used two for these photos and also applied Seche Vite. It's funny that I used to use this one all of the time before I was introduced to Seche Vite! I had to wait so long for it to dry, and I never saw it this glossy and smooth. I really love this color. I'm a big fan of blues and greens, and this teal is no exception! You can see that it's somewhat of a metallic teal, and has tiny flecks of shiny blue and green in it. It really does look like a peacock, so Mystic Peacock is a fitting name. It's a little hard to talk about application since it's an old polish. It has gotten a bit thicker, but I tried my best at applying it. I will try to thin a bit to keep it useable though! 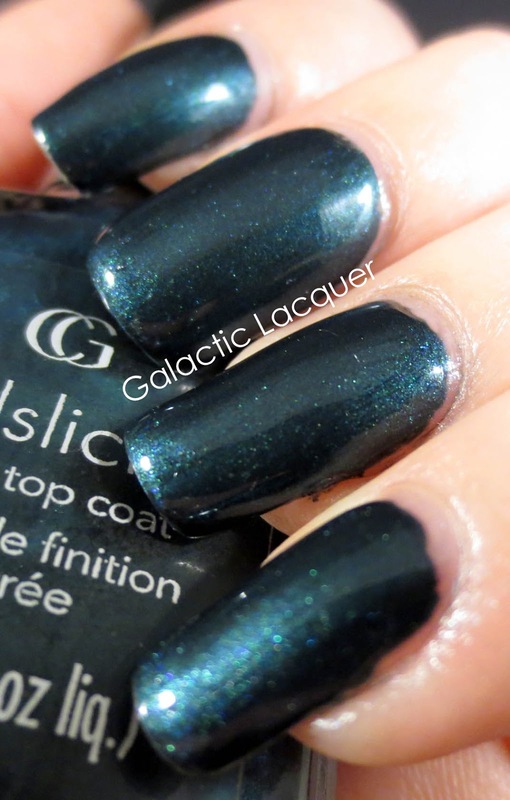 Also, I'm not sure they even make this polish anymore, so I don't know where you can purchase it or for how much. If you find it, I recommend snagging it though! Only a few days of the challenge left! And day two of my experimenting with a black backdrop and different lighting. I think it went a bit better today, and it's a little more true to color. I'm glad because I absolutely love this blue polish! 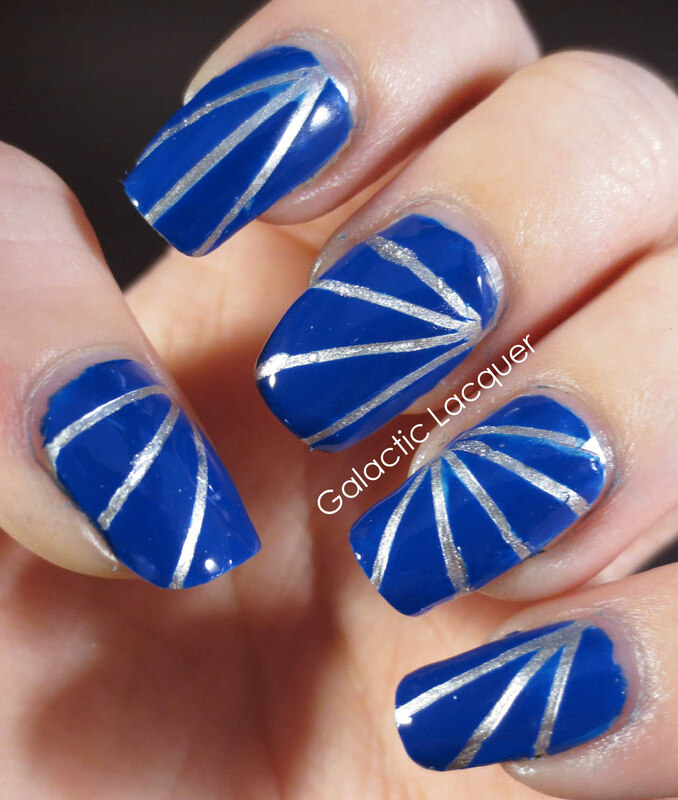 I haven't played with striping tape all too much recently, so I figured I would use it for today's nails. I couldn't think of a good taping or color blocking design otherwise. 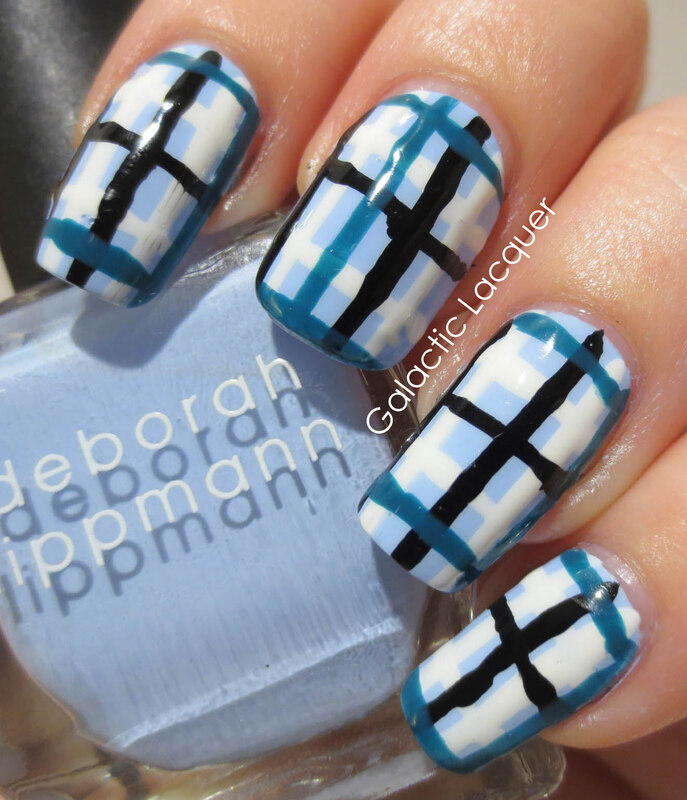 I just went wild with little strips of tape! I made each nail a bit different. 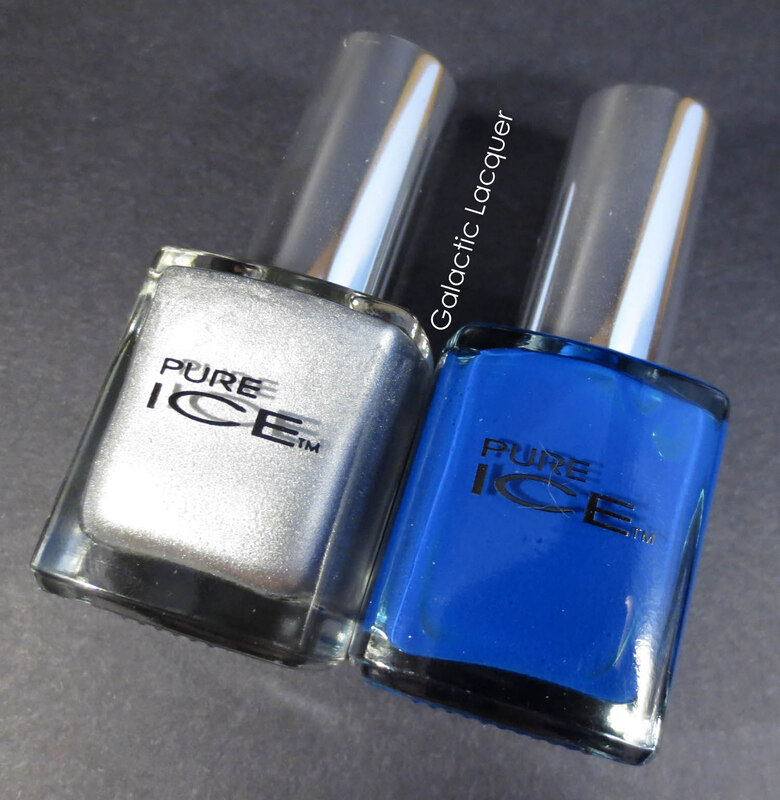 I was also a little messy since I used two Pure Ice polishes, and they tend to be pretty watery. So I got blue polish all around my cuticles and it looks like it stained a tiny bit! I started by painting one coat of Pure Ice Silver Mercedes. It's a pretty opaque silver polish, so one was all I needed! It was a little streaky, but I figured I was covering most of it up, so I didn't bother using more polish. 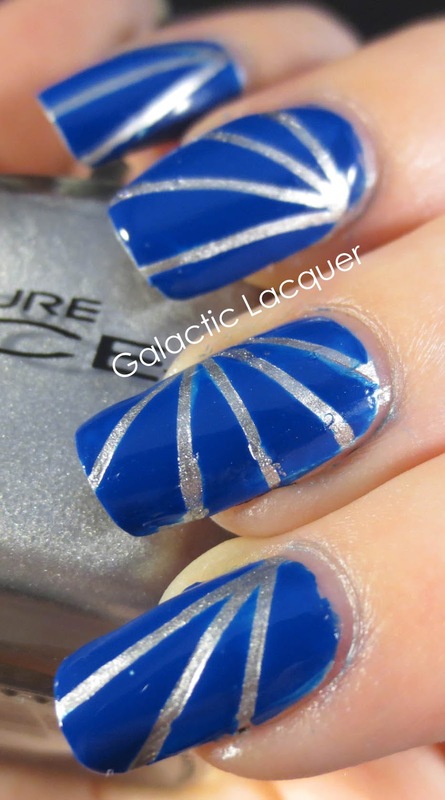 I then placed my striping tape on each nail. I started in a different spot on each one to make them all different. I then painted one good coat of Pure Ice French Kiss over the tape, and then pulled the tape off while it was still wet. It seeped under the tape a little in a few spots, and it also filled in a few spots right after removing the tape since the polish is so thin and watery. I just touched up a couple spots with silver afterward. The lines didn't come out perfect, but I'm loving the blue and silver combination. 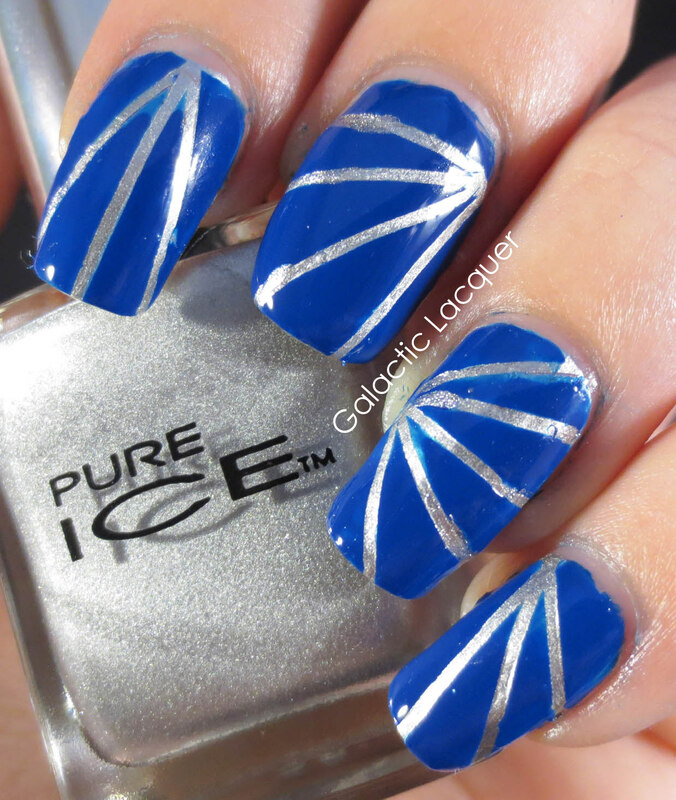 The flat blue creme paired with the metallic silver really makes it pop to me! I don't think it would be as interesting if both were metallic. But maybe it would be! I'll have to try that as well. Almost to the end of the Flip Flop February challenge already! I've been looking forward to doing rainbow nails the entire time. I wanted to try something similar to last year's rainbow nails I did. I switched up the design a bit. I still used dots, and I still did it on top of China Glaze For Audrey though. 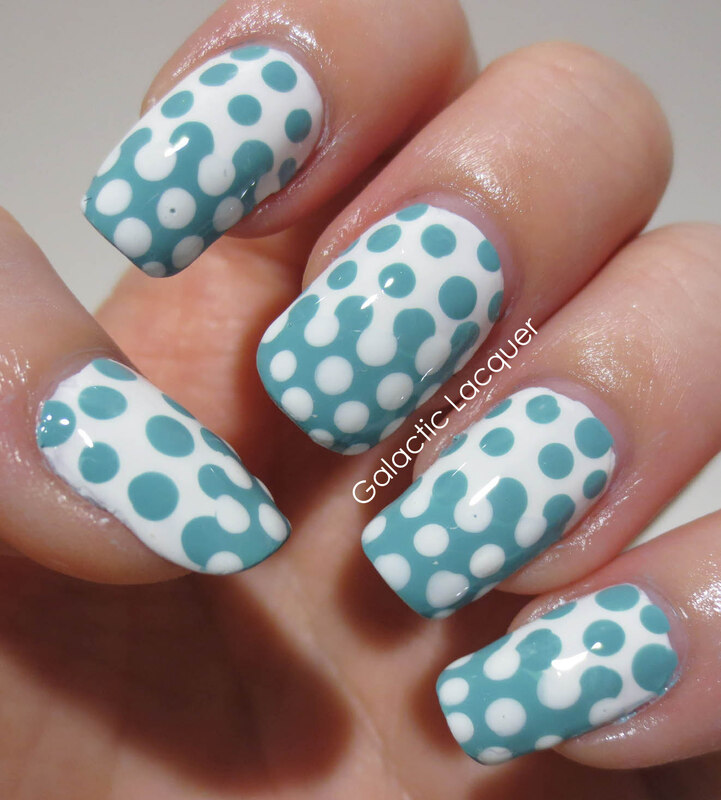 I love dotted designs and I love how rainbow colors look over light blues like For Audrey! I'm also experimenting with different lighting for today's photos, as well as using a black background instead of white. So let me know what you think of these photos too! I'll do it for some future posts to continue experimenting as well. I started off with one coat of China Glaze For Audrey. 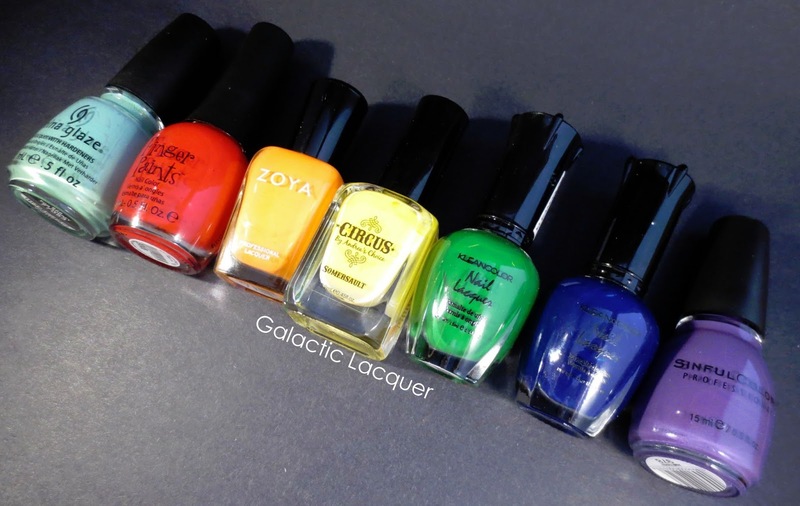 I then dotted on Finger Paints Expressionist Red, Zoya Arizona, Circus Somersault, KleanColor Green Grass, KleanColor Neon Sapphire, and Sinful Colors Amethyst, in that order. 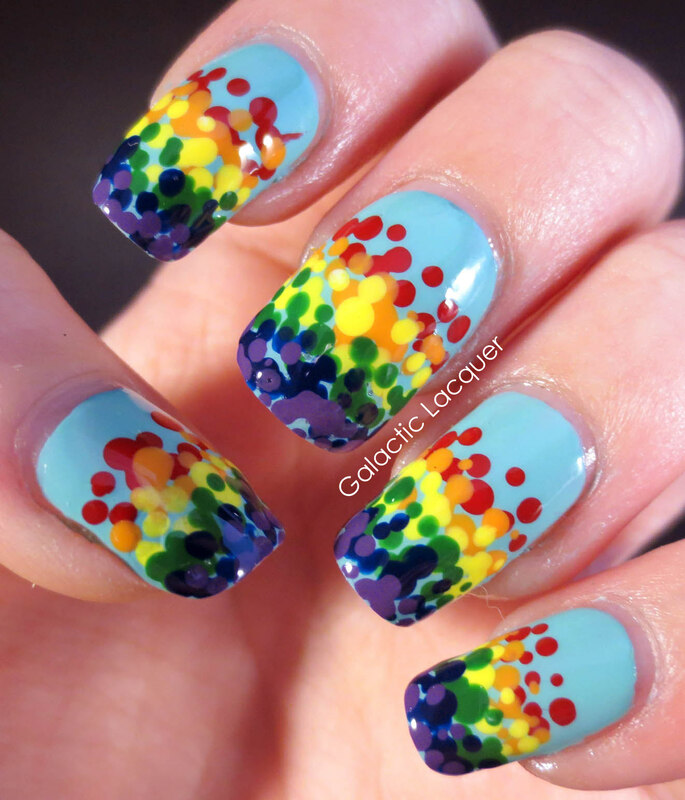 I tried to dot different sized dots sort of randomly to create a rainbow dot gradient. 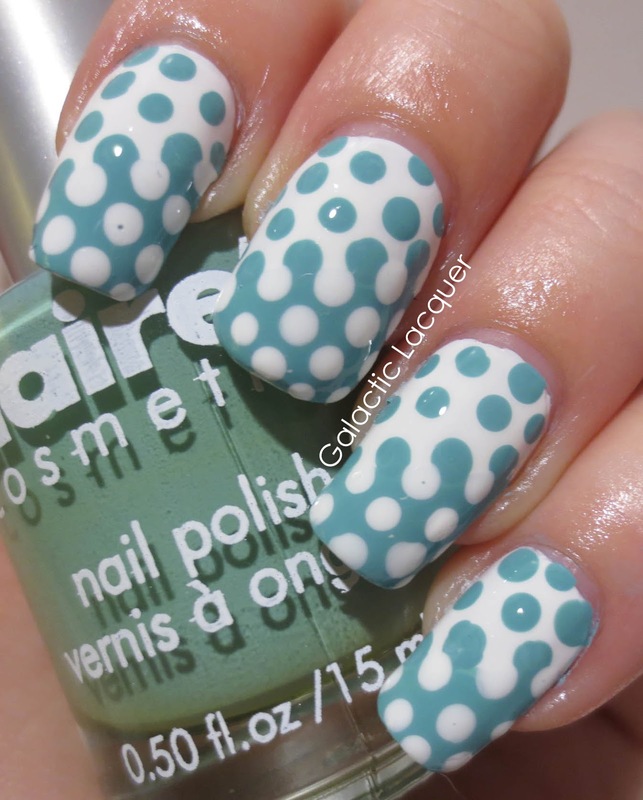 I waited for the dots to dry a bit before applying a layer of Seche Vite, to help prevent smearing them. I was mostly afraid of the dark blue! I considered using a lighter green and a lighter blue, but I wanted to use darker ones so they would show up well against For Audrey. Another success! I love rainbow nails every time I do them. They're so colorful and bright and cheery. I'll have to continue playing around with my new lighting setup as well. 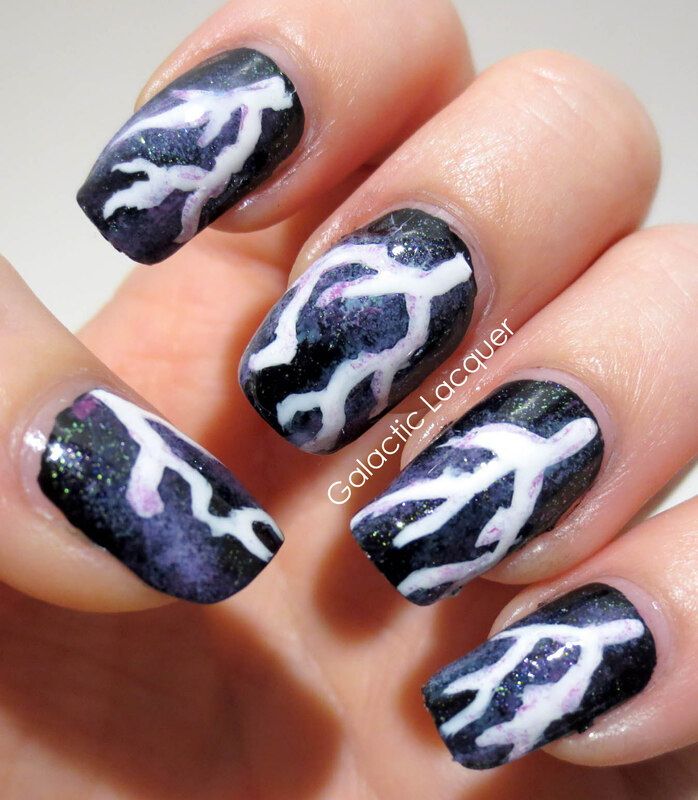 I've seen lightning nails a few times before, both stylized versions and not. I think lightning makes for a really interesting design either way. But I didn't want to just do some zig-zags, so I tried to make more realistic lightning. Well I suppose they're not too terribly realistic, but I tried! I went for a very dark, stormy background, and added random patterns for the lightning. 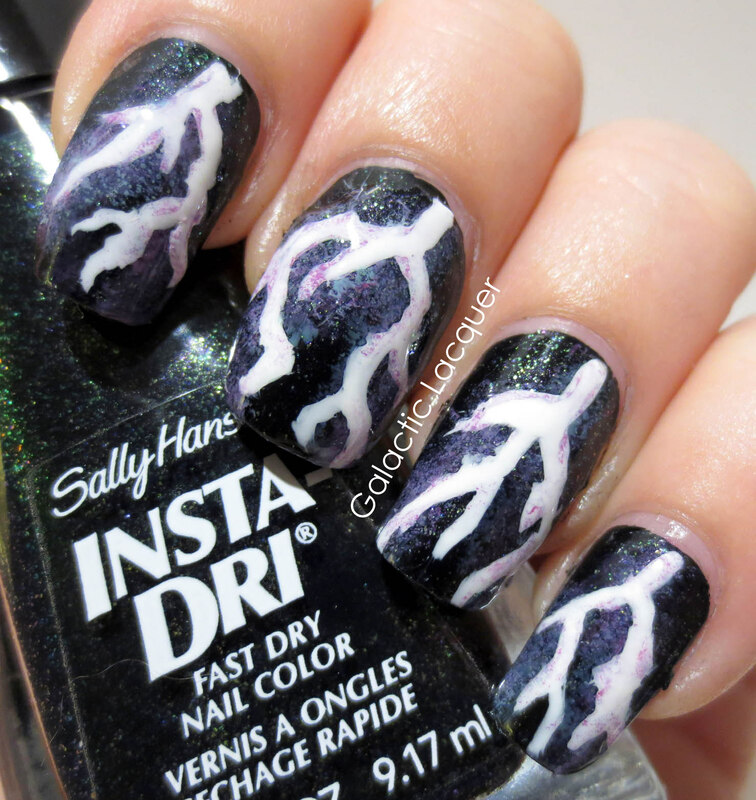 The lightning bolts almost look like veins or nerves. I also wanted to add a bit of color so it wasn't just white strokes on top of black. I sponged on some purple and blue, and it almost looked like galaxy nails before I added the actual lightning bolts. 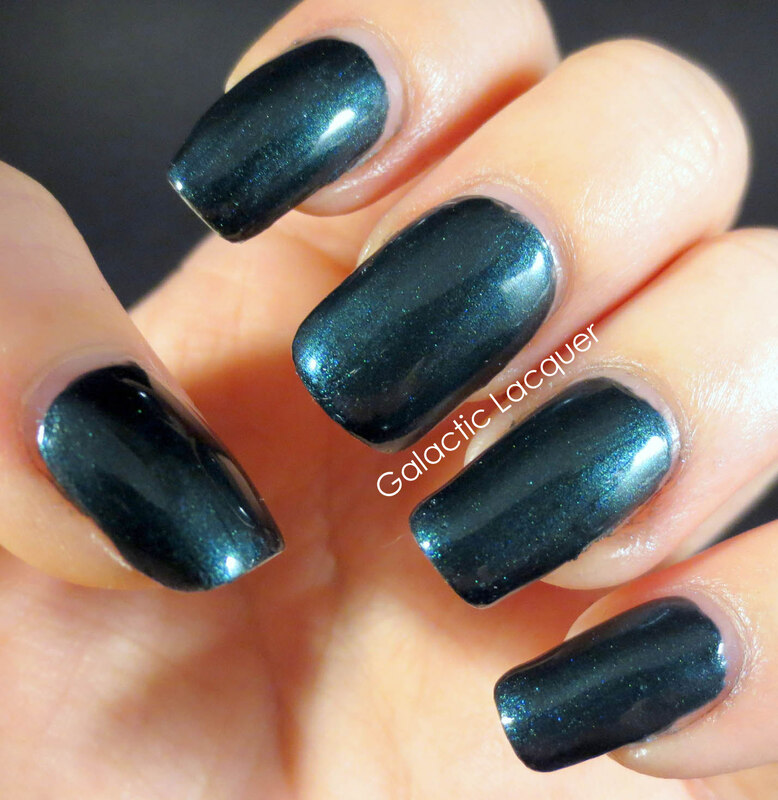 I started by using a base coat, and then painting one coat of Wet n Wild Black Creme on. Since I was sponging, I didn't even wait for it to fully dry before moving onto color. I then lightly sponged on Wet n Wild Through the Grape Vine and I Need a Refresh-Mint where I was going to make the lightning bolts. Since they were a little bright, I added a layer of Sally Hansen In a Flurry, since it is a sparkly dark jelly. I also wanted some shimmer! 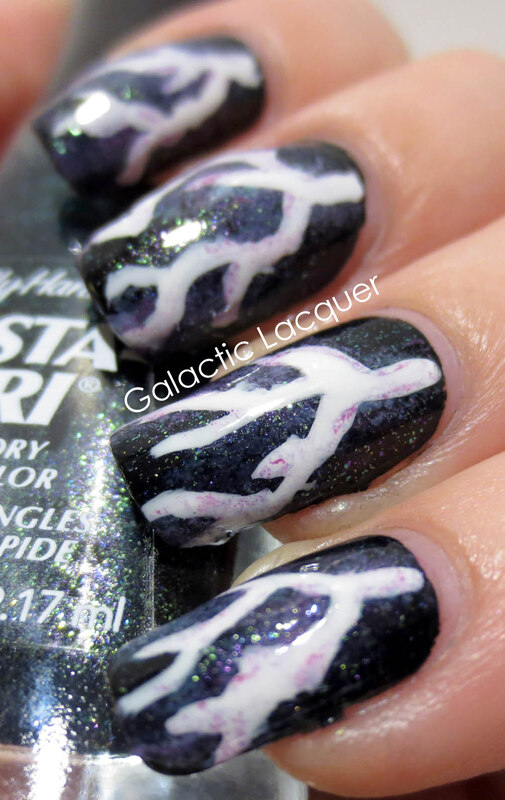 I then free handed the lightning bolts. They looked a little plain to me, so I went back and sponged on a tiny bit more color. I was satisfied with how it looked then, and added my Seche Vite. This is another first attempt that I love! They really do remind me of galaxy nails, and they didn't take as long to paint as I thought they would. I suppose sponging the color on before the previous layers dried help speed up the process. 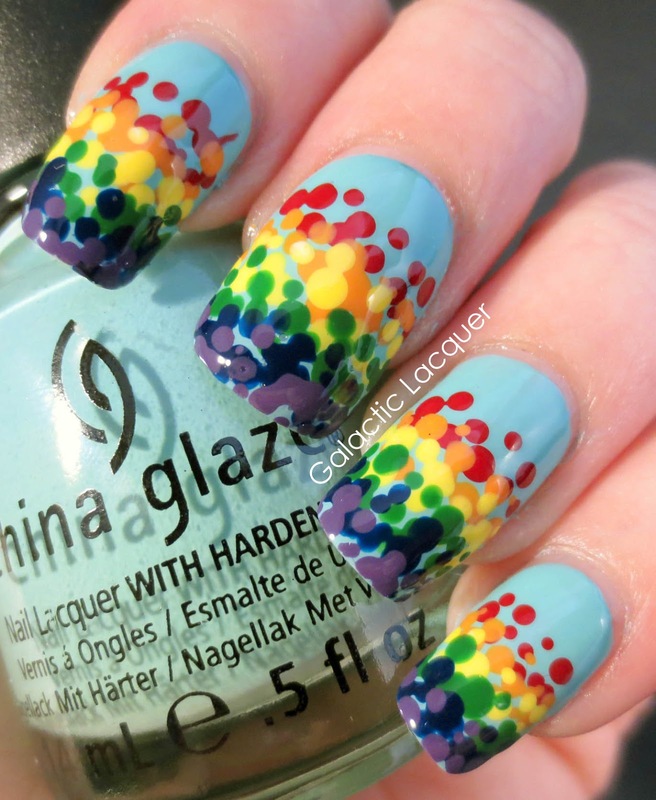 Once again, another pattern I haven't attempted on my nails before! I was unsure of doing plaid because I don't really own anything that's plaid patterned. So I didn't know how big to make the lines or what colors to use. Since I didn't really know what to do, I just sort of winged it like usual! Sometimes when I can't work a pattern out well enough in my head, I just go for it. I chose some blues and just ran with it! I'm not exactly crazy about how they turned out. I suppose it looks like plaid, but the lines don't really go over and under each other like most plaid. It's a little hard to do with paint, so I just layered each color on top of the other. 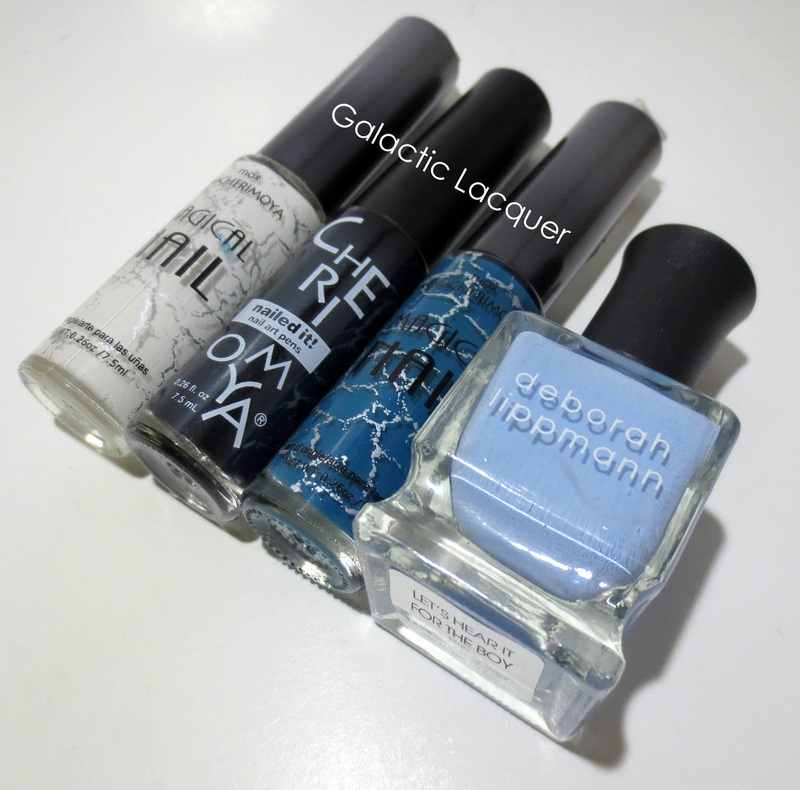 I started with two coats of Deborah Lippmann Let's Hear it for the Boy. I then started with the lighted color I wanted to use for my lines, which was white. I went from lightest to darkest so it would be easier to cover up the colors underneath. White doesn't cover black very well otherwise! I then layered the darker blue lines, and then the black lines. I placed them pretty randomly since I didn't want each nail to look exactly like the other. Looking at them now, I think I should have made them match a bit more though. Something just seems a bit off about them! I ended with one coat of Seche Vite on top. I waited for the black lines to dry a bit before using it to prevent smearing of the lines. It still happened a tiny bit on the index finger though. 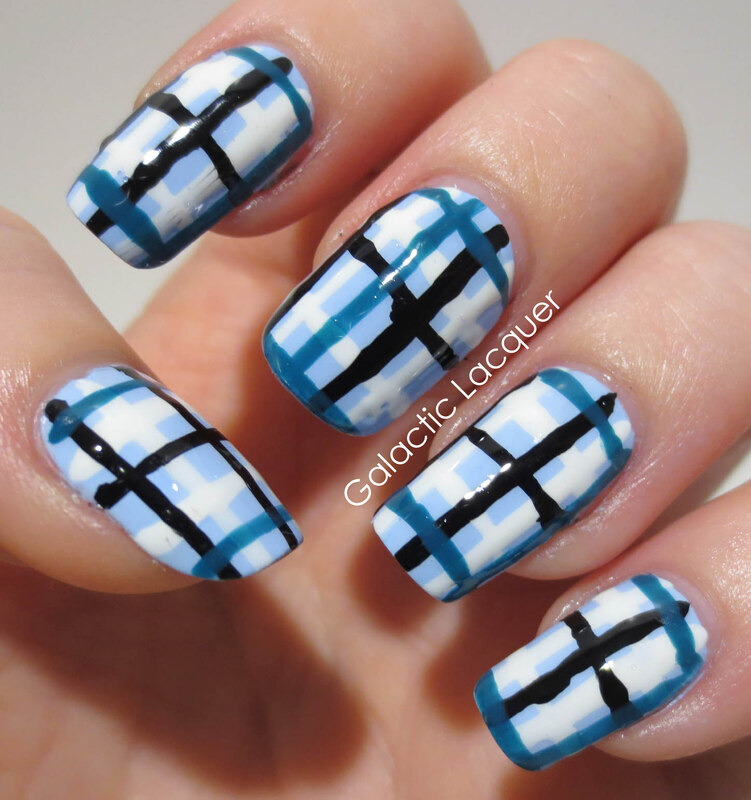 I suppose they look a bit like plaid, but next time I'll try to overlap the lines properly! I've been wanting to attempt a dot gradient for a while now. I just couldn't decide on two colors that would contrast well enough with each other, but also wouldn't clash! I finally just chose two and went for it. I was also afraid of the dotting! Some polishes aren't too opaque, so I thought that they wouldn't cover the other color well enough in the overlapping part. Well the polishes covered well enough, my dots were just a bit off! I still like how it turned out though, especially for a first attempt! It was a lot easier to do than I thought it would be, and I really love the finished product. I used Ulta Snow White first, applying two coats of it. 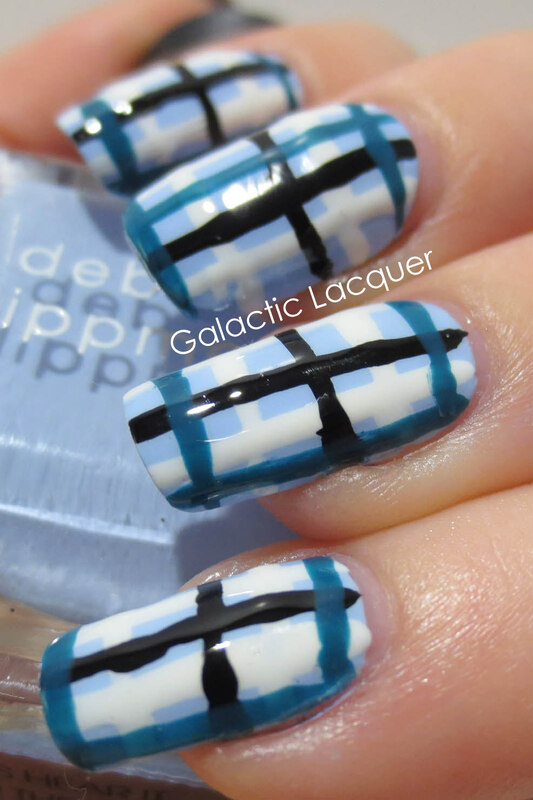 I then free handed a line diagonally across each nail with Claire's Breakfast at Tiffany's. I figured the line didn't have to be perfect since I was going to put dots right on the edge anyway. It's also strange how green the bottle appears, but how blue the polish really is! It's like that in person. I then took a medium sized dotting tool and began with the dots on the line. I did white first, and then filled in the rest of the greenish-blue area with white dots. I did the blue dots next, though they didn't want to cooperate as well! I still really like how it turned out! The dots aren't perfect, but it's not too noticeable unless you stare at it for a long time. In person, it's just so overwhelming with dots that you barely notice! I couldn't decided which design I wanted to do today! I haven't done flowers in a long time, and I have never tried a "v" gap. I was leaning more towards the flowers all day, so I finally just went for it. I also wanted to wait until I was done building and filling up my new Helmer so I wouldn't ruin my nails! I suppose my flowers are a bit abstract since they're just dots though. 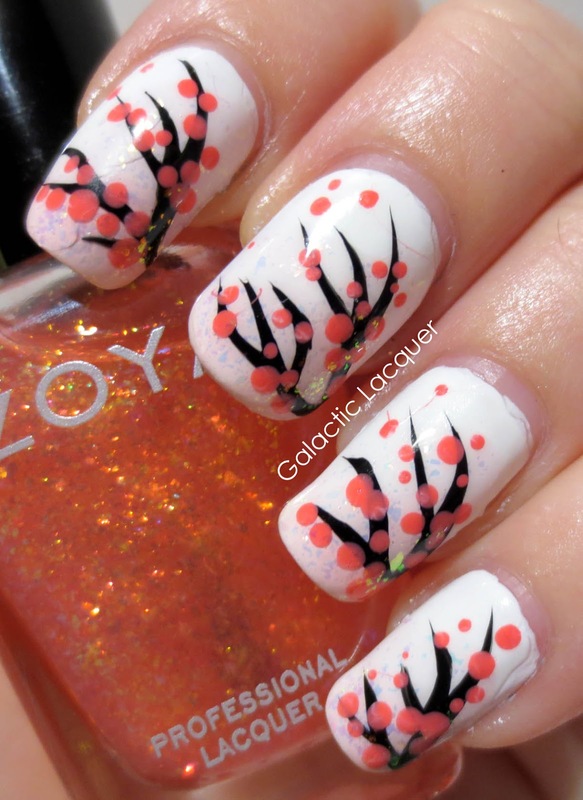 But I chose to do an interpreted version of cherry blossom nails. 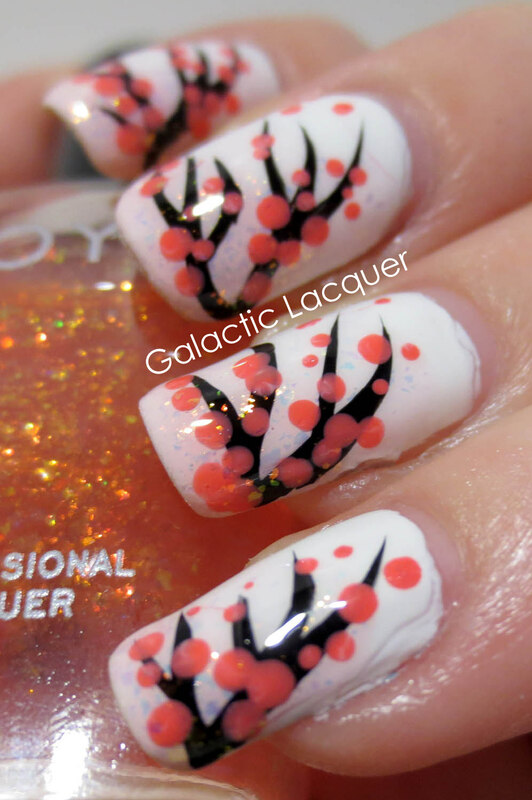 I don't think I've done cherry blossoms since I did flowers for the 31 day challenge last year! I really like how these turned out! I'm so happy with how simple and clean they are. Last time I used two colors for the flowers, and it just seemed off to me. So this time I stuck to one color to keep it simple, and I really like it! I also have more a contrast with the colors I chose this time. I made the branches black instead of brown, and did it on a white background. I used Ulta Snow White for the background (two coats), and then added a few coats of Zoya Chloe to the corner. I just sort of dabbed it on randomly to create a soft, pale pink glow in the background. I then free handed the branches on with a black nail art polish, and dotted the flowers or sakura petals with Elf Flirty Fuchsia. I topped it with a coat of Seche Vite after waiting for it to dry a bit, so I wouldn't smear the black lines. I really love these! I didn't think they would turn out so well since they looked pretty boring last time.